The 13th edition of ProPak Vietnam is getting bigger and better year by year. Giving back to back successful expos makes it more confident to grab more opportunities. Propak Vietnam being the pharmaceutical hub in the country attracted 540 exhibitors from 31 countries. 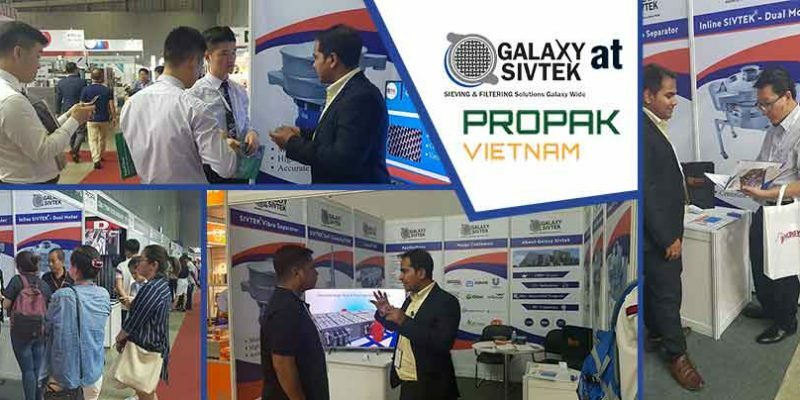 Galaxy Sivtek - The all-time exhibitor of ProPak Vietnam participated this time on 19-21 March 2019. This time also Galaxy Sivtek shows its best performance at the exhibition with its high tech sieving & Filtering technologies. Galaxy Sivtek is the world's largest sieving & filtering equipment manufacturer covering more than 12+ industries. Galaxy Sivtek was present at Stall FP:16 to resolve the sieving & filtering problems of the industry leaders in Food Pharma and FMCG industries. All these industries are recently facing quality issues in their product. This is due to unwanted particles or impurities introduced due to human intervention in the packed material. To resolve this we are having variety of sieving equipment which can easily remove impurities. Impurities make the sweets bitter, No multinational brands tolerate this in their product. That's why industry leaders are preferring Galaxy Sivtek vibro separator and Self Cleaning filter as their screening equipment. We are also capable to remove ferrous particles from the mixer. Galaxy Sivtek showcased solution to many different visitors from around the globe. The feedback was satisfactory and they were convinced to introduce SIVTEK solutions in their processing plant.